The WAXIE VERSA & VERSA II cleaning caddies are no-touch cleaning systems designed to remove the maximum amount of bio pollution. Each machine combines automatic chemical metering and injection, an indoor pressure washer, and a powerful wet vacuum into an integrated system. 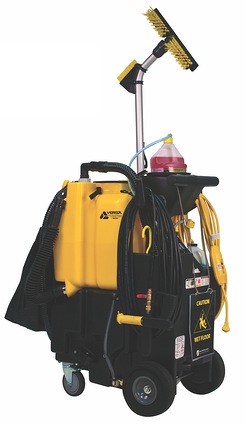 This combination allows workers to thoroughly clean without touching contaminated surfaces. The shape, height, weight, pressure and hose length of the equipment is designed to fit various cleaning situations with worker comfort and efficiency in mind. Ease-of-use, trouble-free transport, and tangle-free operation are all key components in the foundation of our design. 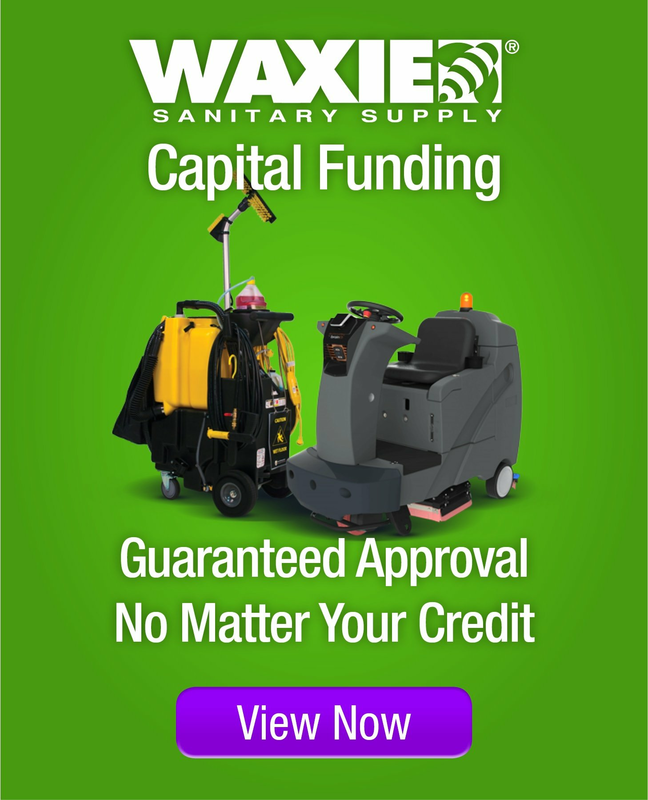 Regardless of size, every facility can find the perfect cleaning solution in WAXIE VERSA or VERSA II. These versatile machines offer the flexibility of wet or dry cleaning, on hard or carpeted surfaces anywhere in a building, including bathrooms, kitchens, stairwells, classrooms and more. Dirty, unsanitary restrooms are consistently the number one building maintenance complaint. They’re often the number one building health hazard too. That’s because a restroom is really a biohazardous waste transfer station – a primary source of disease causing organisms. Alarmingly, studies confirm that many biocontaminants originating in the restroom ultimately make their way throughout the building. The reality is that you cannot have a truly healthy building if your restrooms are not well cleaned. Unfortunately, traditional restroom cleaning tools like mops and wipes remove very little soil, bacteria and other indoor pollutants. Studies show that they often simply redistribute and cross-contaminate. Then workers end up crawling around on their hands and knees wiping soiled surfaces and fixtures by hand. No-touch cleaning dramatically increases productivity compared to conventional cleaning methods. According to ISSA, it takes an average of three minutes to clean a restroom fixture. In many restrooms no-touch cleaning cuts that time to one minute, leaving surfaces sparkling clean in one-third of the time. WAXIE VERSA & VERSA II remove soils, urine, germs and other indoor pollutants that traditional cleaning tools like mops leave behind.